The BA6267 and BA6267F CAN be connected with a High-Voltage circuit such as the MOS and CAN be used to drive high-current circuits such as lamps and relays. It CAN also be used as a Buffer to drive TTL input. By ROHM Co. Ltd. This is one package pinout of BA6267,If you need more pinouts please download BA6267's pdf datasheet. 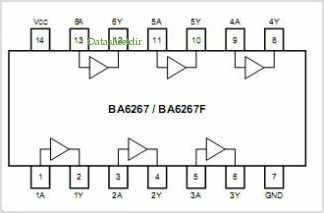 BA6267 circuits will be updated soon..., now you can download the pdf datasheet to check the circuits!